Frugal and Thankful: The Frugal Friday. Why am I telling you all this? Well, I still need some help or a reminder once in a while on how to stay on track. I was inspired by some of the bloggers to take an extra look at what efforts they put into staying on the path of frugality over the week. And I decided to create "The Frugal Friday" - Friday when I will look back and see what thrifty steps we took, deals we got, and any other budget-related thoughts or efforts. Maybe, I will write about 5 frugal things that we've done last week or I, perhaps, I would just boast a little that we stayed under a budget or that I went to the store only once that week (yea, like that's gonna happen...). Anyway, I want you to join me :) Come over here every Friday starting next week and share your penny-pinching success with all of us. And to finish on a frugal note, check out this awesome chair that I have scored completely free from the local classifieds. So will you join me on the Frugal Fridays??? That is a very nice chair. Can't wait to see the make over. I like the idea of Frugal Friday and will try and join in. Great Idea, Lena, to do a Frugal Friday ! love the chair. Public accountability always makes a difference. Good luck with your Frugal Fridays and I look forward to being inspired. Sounds like a great idea Lena! I will make sure I'm here on Fridays for some inspiration! 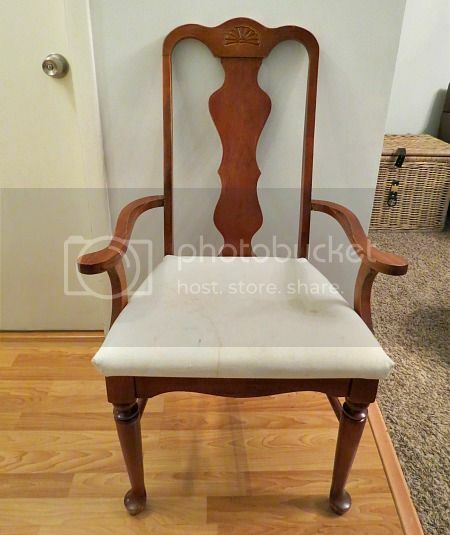 What a beautiful chair! So good to see you today. That chair has great bones - you scored a great find Lena! Can't wait to see it once you've fixed it up! I think it's a great idea to set aside a day to think about frugal successes and gain ideas from each other of other ways to be more frugal! My frugalness this week was buying some second-hand neutral decor items for my condo when I need to stage it for resale. I found some really great stuff at low low prices!